It's What if? Wednesday time at The House That Stamps Built and we're ready with a new sketch challenge for you. 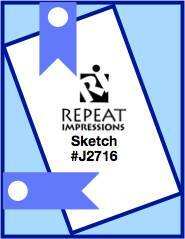 Sketches have so many fun opportunities for creating beautiful cards and projects. I was thinking about this sketch while I was looking at some retro beach photos on Pinterest. I love those old postcards that show off having a fun summer some place far away from home and friends. I took the sketch and flipped it then went a tad retro. I hope you can "see" the sketch in this card. I flipped it. I used RI #1404-S "Nubble Light (lg) for the image and after stamping it with Archival "Water Can Grey", I watercolored it using my Koi watercolors. I then coated it with VersaMark and covered it with clear embossing powder and heat set it. I repeated the process twice more and got this high gloss look. The sentiment is RI# 1145-G "Greetings From" . I used a Memory Box die for the seagulls and colored them with Copic Markers and placed them in the areas depicted on the sketch. You are going to have some fun with this one....I know you are. Please share your creation with all of us at The House. 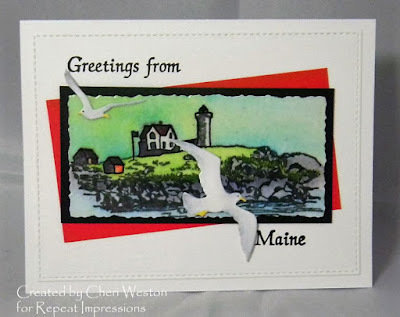 You can enter for the drawing for $25.00 worth of RI Stamps.....and if you can't wait and want to shop, please use the code at the right hand side of my side bar for 10% off your entire order of RI stamps. You really should take a look at these awesome creations for tons more inspiration on this sketch. Love your retro card - beautiful scene - so peaceful I think you did great on the sketch. another gorgeous creation by you!!!!! Cheri- you did a superb job on this one! Cheri, this is so pretty! What a beautiful scene you created, using Wendy's fun sketch. Great job! OMGosh SS this is gorgeous. I enlarged it to see the shine but didn't show up but I know how glossy it is after seeing your tutorial at The House some time ago. I love that scene and so beautifully coloured. those seagulls are awesome. Amazing take on the sketch. I struggle with sketches sometimes but will certainly be trying my hand with this. Hugs. Maybe those seagulls could fly my way. Awesome job with the sketch - like the use of the Sea guls! This is fabulous!! I LOVE your take on the sketch; and definitely see it in your finished product. The seagulls are perfect for the "banner" elements. Love it!